If you’re going to brag that you can do something just as well as someone else can, you really should make sure you’re going to be able to pull it off. Otherwise, you’re going to come off looking like a complete berk. Here’s a case in point: Sega’s Virtua Racing hit the arcades in 1992, and pretty much touched off a firestorm among racing game enthusiasts and arcade rats. 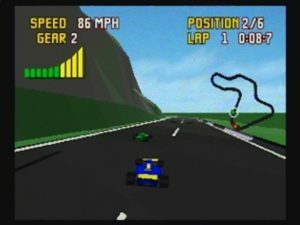 True, the polygon graphics were not entirely realistic, but it was the first time a 3D racer was a legitimate improvement over its 2D kin. Its sleek graphics and fluid playability cemented its style as the next step in the future of racing games. Daytona USA would follow, Crusin’ USA and Ridge Racer would offer some competition, and even Stunt Race FX on the SNES would try to get in on the action. But the message was clear – it was 3D polygon racing, or you’re out. You know the rest, and the plan obviously didn’t work out. But the potential actually is there. Checkered Flag does manage to crunch polys acceptably with no additional hardware. 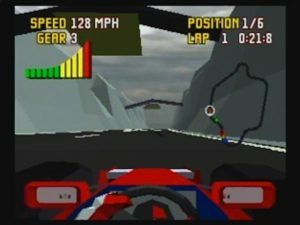 It doesn’t match the clean look of Virtua Racing on the arcade, or contain as many graphical tricks, but it could easily be passed off as an acceptable home port of that game, featuring varied 3D tracks and graphics not seen on 16-bit systems… EXCEPT for the framerate. Cockpit view. Note the mirrors show racers behind you, but not the track. Instead of estimating the frames per second, I used the most scientific method available to me – capturing the video with a DVD recorder (to get these screenshots), opening it in an editing program, and counting the unique frames displayed in a 1-second section of video. The result was an average of 10-12 FPS. About 16 FPS is the absolute minimum for the human eye to see seamless motion. 10 FPS approaches the quality of a flipbook. The result is that the video looks visibly choppy. Scenery doesn’t fly by in a thrilling sense of speed, rather, it jumps to closer positions like the TV girl from The Ring. Most of it is tolerable, but once you hit the 100MPH mark, all bets are off. Especially if you come to a turn with other racers around – one second you’ll be hitting the turn, the next instant you’ll be flipping off the wall on the other side. Manipulation of your camera view can help this somewhat (the widest view actually helps the most) and I suppose it is something that you can adjust to with time. I personally found it very difficult to sit through. I also made the mistake of trying the first playthrough sitting directly in front of a 56″ DLP – I played until I was pretty confident I was about to yack all over the Jag. That sense of pure speed is pretty crucial to a racing game, and really, anything less isn’t going to cut it. I would say Checkered Flag is right at that threshold of “barely acceptable.” The story goes that the code shoddily relies too much on the familiar Motorola 68k (requiring it to run significantly more code than the Jaguar’s actual graphics chips), and as such makes an example of the Jaguar likely hobbled by technical issues, not necessarily lack of capability. But whatever the reason, while CF is not unplayable, it isn’t desirable either, and certainly not an example of wild, wind-in-your-face excitement. That the Genesis port of Virtua Racing looks roughly comparable, and sports a framerate that blows this attempt away (though it required an extra chip and higher price to do so), only acted as additional egg on Atari’s face. The second hit comes from the controls. Simply put, it oversteers unbelievably. 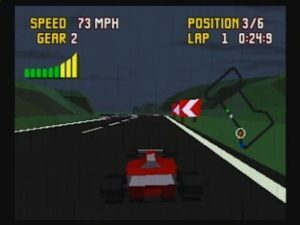 The manual states that the game interprets steering using a bell curve – keep pressing in the same direction, and you go from a gentle turn to something sharper. I suppose this is emulating actually turning a steering wheel (the angle of your turn would increase as you continue to turn the wheel), and is the best method to convey some variance in the strength of your turn without an analog joystick. Rain effects, which, of course, don’t help the framerate. In practice, it’s pretty hard to get the hang of. It seems to me that the time it takes to ramp up to a “full turn” is far too short. Within about half a second of pressing a direction, you’re going to snap into a right-angle launch at the nearest wall. The framerate may also be messing with my timing, but the result is that you have to sort of tap the car into these turns; updating your turn with taps throughout. Braking also seems to help, but actual precision driving was pretty much out. It was a victory for me if I didn’t crash. Speaking of crashing, you’ll just flip a bit before dropping back in the right direction with all four tires on the road. Excessive crashing will put you too far behind to recover, but catching up to your competition after one or two knocks is surprisingly easy. You can have up to five AI opponents, and it seems like their cars cannot come close to matching your maximum possible speed. I was consistently able to roar past the top three cars after a crash without really trying. Their cautious, responsible driving made me feel like a maniac, and seriously wonder if I was playing the game incorrectly by going so fast. If you get into it, you’ll find a respectable set of options to keep you occupied. There are ten unique tracks with three different road conditions you can set. You can also select wet or dry tires, depending on the weather, and a high or low airfoil, depending on the curves. Honestly, I had enough trouble with the standard controls, so I’m not in a position to tell you if these kit options do anything. Finally, you can enter a proper tourney where the track and conditions are selected randomly, and your placement in each race brings you closer to the trophy. Checkered Flag alone isn’t horrible, and there’s certainly enough tracks and options on the cart to make it worth the money. However, when you throw in a jerky framerate and controls that use a different methodology than any other arcade racer out there, it just doesn’t stack up. It could easily have been a hell of a contender at its release, and brought the Jag some much-needed positive press, but bad code (or lack of time), better competition, and oversold promises drove this one right off the bridge. Graphically okay. In stills, looks like a home port of Virtua Racer. Large number of tracks. Some sim-like kit options if you get into it. Very poor framerate requires “tolerance” from even the most generous. 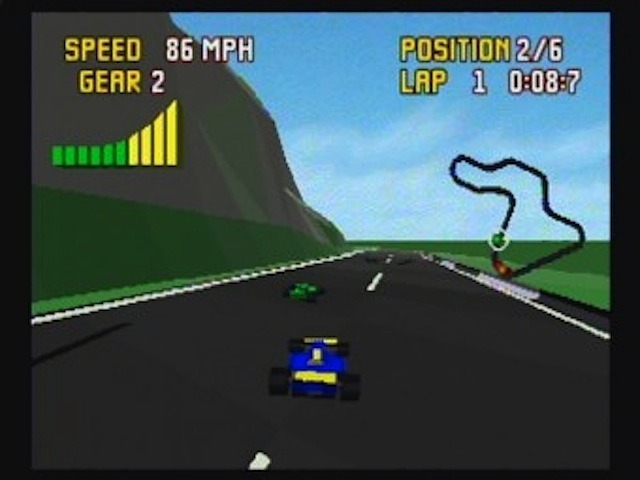 Oversensitive steering makes for confusing control compared to similar arcade racers.